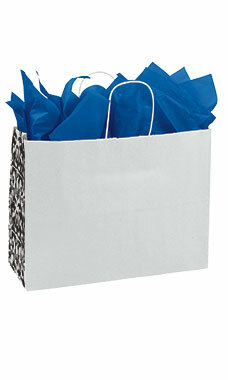 The Large White Damask Gusset Paper Shopping Bags are a unique bag that are perfect for any store. These bags are white paper with a white interior and white twisted paper handle while the gussets feature a black damask pattern. This bag measures 16”L x 6”D x 12”H with 70# paper weight. These bags are also perfect for customization and adding your logo to the front and back. Sold in cases of 250.